Riyaadh Hijaab, the inept chairman of the Higher Negotiations Committee (yawn) has just tendered his resignation from Saudi Arabia just like Saad Hariri. Hijaab was under house arrest where Clown Prince Muhammad bin Salmaan (MBS) shook him down for the $25,000,000 KSA paid him to leave his post as PM in Syria and lead the gentrified opposition. We don’t know if Hijaab coughed up KSA’s side of the bribe, but, he did agree to stop the charade that there was a realistic opposition to Dr. Assad’s presidency. Hijaab will never see Syria again. If he does, it will be from a dangling position with a thick rope tightening around his thick neck. Hijaab, like Charley Rose, and David Cameron, Francois Hollande, Guido Westerwelle, Zapatero, Berlusconi, Obama, and Clinton, has found his special niche in the septic tank of history. Is John McStain still alive? When will Hilary “grace mugabe” Clinton go the way of McStain. Ziad, seven days without an update is too much for me to handle, i know you have other things to do but events need an updated maybe every 2-3 days. please have mercy on us. a couple of hours ago ISIS terrorists attacked a mosque in rafah, egypt. people were gathered for friday prayers, the terrorists opened fire on the worshipers killing more than 150 and wounding a lot more. “Septic Tank of History” – Ziad’s savvy opening to this thread included > ‘Riyaadh Hijaab, like Charley Rose, and David Cameron, Francois Hollande, Guido Westerwelle, Zapatero, Berlusconi, Obama, and Clinton, has found his special niche in the septic tank of history.’ We all know that’s just Ziad’s today’s short list. It would be great if a SyrPer with web skills would create a “Septic Tank of History” web page with the rapidly growing list of Septic Tank members – periodically posting on SyrPer link to updates, and inviting additional candidate nominations. Bundy might provide the logo pix. Mike. Israel takes control of Syria’s Eastern oil fields using their proxy Kurdish communist terrorist organizations “YPG, SDF ,and PKK”. The Oden Yinon/PNAC plan is still in play. Since they could not expel President Assad, this is their plan B option. Dr Assad and the Syrian people can be proud of what they have accomplished. There are still battles ahead, like in Idlib and to push the US out of NE Syria. The Syrian people have done the impossible against the US Empire of Insanity. The new “Hitler” in the ME is declared by the zionist , Prince Bin Salman Al Saud. Nice to have a fellow jew in charge over in the SA says Jared Kushner. Trump Factor: Trump to Erdogan > arms to YPG stop. Will SAA now cross river? “On 24 Nov, day after Erdogan w/ Putin & Rouhani at Sochi, Turkish Foreign Min. Cavusoglu said Trump told Erdogan phone call US will cease supplying arms to Syrian Kurdish fighters. Trump stated gave clear instructions YPG won’t be given arms and this nonsense should have ended long time ago.” (Heard this story before – trying reverse Erdogan playing both sides drifting to Russia/Iran vs. NATO. Will SAA now cross river, unopposed? Will know soon. Mike). 13 SAA officers arrested for planning attacks on US forces in Syria. Sh*t about to seriously hit the fan in the US. The political, hollywood government paid actors, billionaires, bankers, etc..will be exposed for century old pedophilia practices.This will link to UK and the common wealth countries,mega sh*t storm ahead. the goal would be to empty the northern Sinai from its population (through terror attacks) and transfer there the daesh assets that were rescued in syria/Iraq to form a mini state. Its very likely. – from different directions. Elite force NE Hama & S. Aleppo kick-off final phase imminent op. to capture strategic Abu al-Dhohour airbase SE Idlib. SAA not expect much resistance in Idlib as rifts widened among terrorist groups. 2010 pop.165,000. 3rd & 5th Legion & Repub. Guards full control over al-Rashadiyah, main Aleppo supply line.” (Just 37 miles SW of Aleppo – Idlib’s turn to be liberated. Go Syria!! Mike). The Russians have just tested their anti-nuke-ballistic-missile-missile. Don’t blink. Alert > 24 Nov. reported Trump phone call clearly told Erdogan > “US stops arming YPG,” per Turkey Foreign Min. Çavuşoğlu. If implemented, great news for Syria. Following up today noted US MSM appears reluctant confirming YPG arms halt – also, Israel news silent. Today in Antalya (Turkey’s 5th-largest city) Çavuşoğlu told reporters > “We want to see Trump’s promise not giving arms to YPG being implemented. US shouldn’t have business w/ terror groups.” (Deep State wants YPG armed & resisting – Trump often must ‘fight’ to demand orders followed. Stay tuned. Mike). “No progress for months trying to get new peace process in Israel, diplomats say Trump Admin. “fed up” w/ Israeli officials, and Netanyahu in particular. Israelis Refuse Every Request to Build Confidence like remove check points, stop building. Netanyahu dismissive every discussion of Palestinian state, or making progress, comes up. (Above pix shows tension between them, as Trump continues loyal to his pledge ‘America First’ & no regime change. Mike). 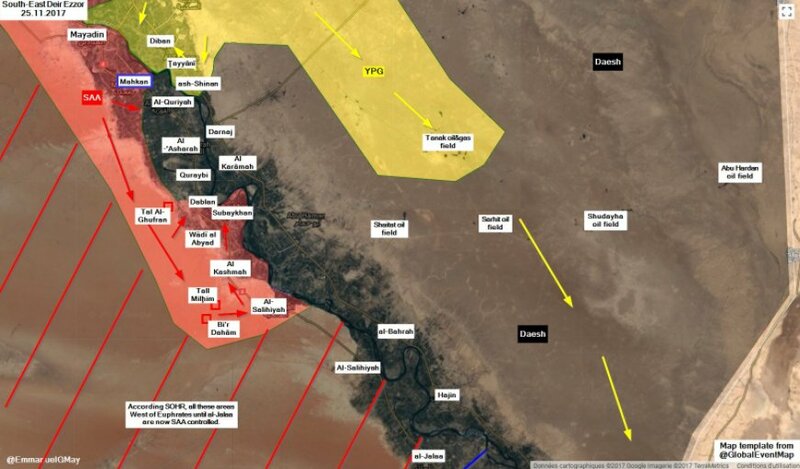 Syrian Ddemonic Forces reach Iraqi border 9 kms north of Albu kamal , after “advancing” 40 kms from Tanak oil field. ISIS only fights the SAA while allowing safe passage to the forces of demonic possessions. President Vladimir Putin Has Destroyed 10 Years Old EVIL JEWISH Plans For Syria! Whole Syrian Conflict in 11 Minutes! What did the Yemeni people do to deserve this? What did they do to us that we would assist the Saudis regime in doing this to them? If killing and chaos, if the economical warfare and crookedness of our political processes are the illness, then rampant Zionism is the contagion. From my perspective western societies have been literally infected by an insidious flesh eating bug, a blood sucking tick that spreads a bigoted and elitist disease that will eventually destroy us all. The United States’ aggressive and provocative actions in the South China Sea, North Korea, Ukraine, Syria and elsewhere are best interpreted as the flailing’s of a declining empire. The real question is will the United States accept the disappearance of the unique power that it has wielded since the Bretton Woods agreement of 1944 and adjust its policies accordingly, or destroy us all in their attempts to recapture a lost world. The Russian Center for Syrian Reconciliation has located Jabhat Fatah al-Sham terror group (al-Qaeda Nusra Front) inside the country’s Southern de-escalation zone. 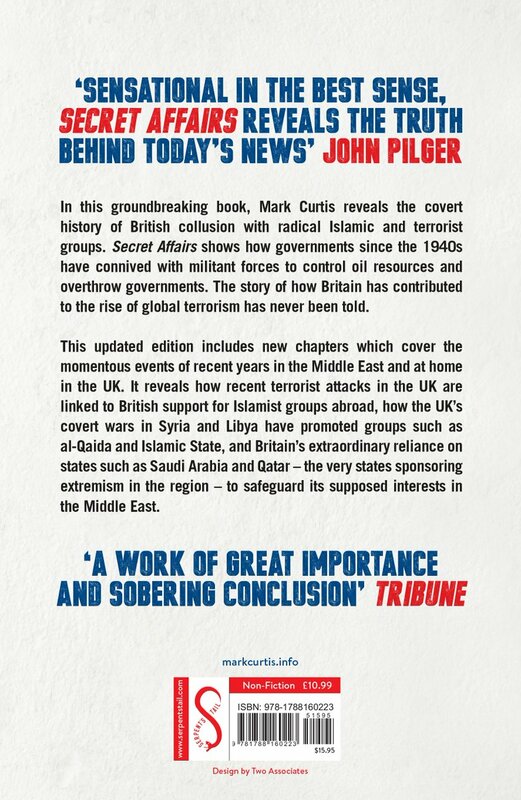 new book, the updated *Secret Affairs: Britain’s Collusion with Radical Islam*, is released on 4 January. It contains new chapters on Syria, Islamic State & 2017 UK terror attacks. US in the auto business now since they got out of the arms business, over 100 humvees delivered to YPG.